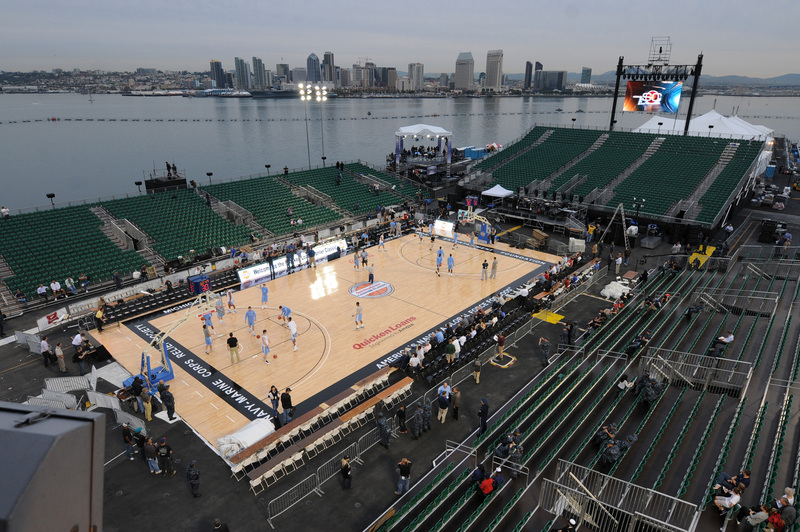 Organizers of the Quicken Loans Carrier Classic game and ESPN were thrilled Thursday that a Pacific storm might hold off any rain until well beyond the basketball game’s tip-off at 4:15 p.m. Pacific time Friday on the flight deck of the aircraft carrier Carl Vinson in San Diego. 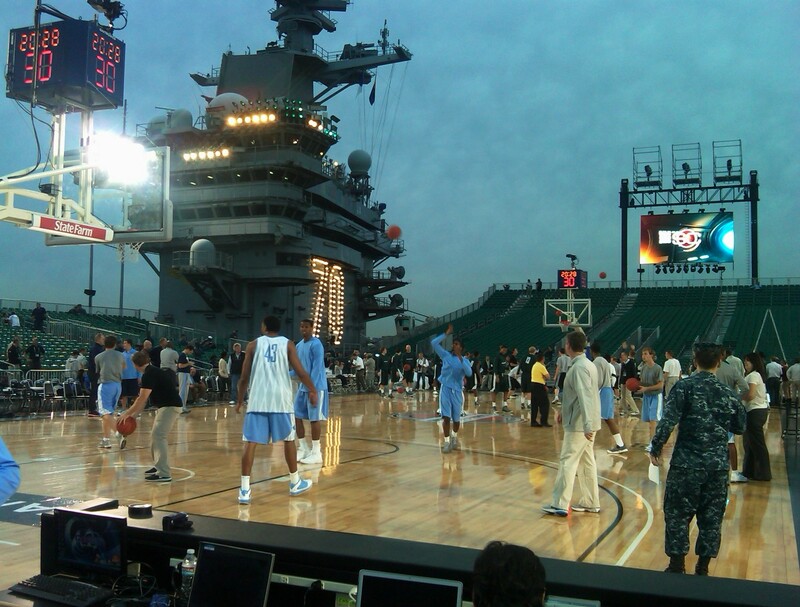 A rainy forecast had threatened to force the season opener between Michigan State and the University of North Carolina to the hangar deck below. But by midday Thursday, throngs of journalists converged on the flight deck on a comfortably balmy day for pregame activities that included a press conference with team officials and organizers and the first practice by both teams on the pristine but outdoor hardwood surface. In recent days, workers assembled the basketball court and surrounded it by bleachers lined with green plastic seats. Bright lights and a pair of huge high-definition screens flanked the makeshift arena built atop the hardened steel deck that’s launched and recovered thousands of fighter jets and combat aircraft over the ship’s nearly 30-year career. But preparations for the game, and its accompanying festivities for the teams, dignitaries and fans, haven’t interfered “one iota” with the ship’s training or operations, Lindsey said. In fact, he said, it’s provided real training for some members of his crew, including those in supply. Still, the transformation of such a formidable warship into a sports arena was something to marvel. “It makes it look much smaller,” said Chief Aviation Boatswain’s Mate-Equipment (AW/SW) Robert Sanders, who joined other sailors in the bleachers for a break to watch the teams practice. Just off in the distance, beyond the ship’s waist, lights dotted the San Diego city skyline as dusk neared. “Honestly, if the island wasn’t here, it would seem like we’re sitting in an arena,” he said. Both sailors plan to attend the game. Sanders will bring his wife. “My wife is real excited. She’s a huge basketball fan, he said. “She just wants to be in the same realm as the president.” That’s where Manzanares hopes he will find himself. “I’m going to try to get his handshake,” he said, quite confidently. Aviation Boatswain’s Mate-Equipment 3rd Class (AW) Josh McNeese sat with them in the bleachers and just took in the whole scenery. McNeese has a ticket and is excited for the game to begin. “This is actually going to be my first big event,” he said. “It’s about honoring the people who have served and are serving today,” said Mabus, who visited the ship Thursday afternoon. He will be there in the crowd for the game Friday during his three-day visit to San Diego that will include the Saturday christening of the Navy’s newest resupply ship Medgar Evers, which is being built across the bay at the General Dynamics NASSCO shipyard. Carl Vinson’s role as the host for a nationally-televised game honoring veterans also puts the big spotlight on the naval service. “This is America’s ‘away’ team,” said Mabus.